Dwarf perennial with an erect, simple or sparsely branched annual stem, growing from a tuber. Leaves spreading erect, rather variable, mostly lanceolate to elliptic, up to 50 × 8 mm, finely hairy. Flowers on short pedicels in axillary 9-12-flowered clusters. Corolla c. 10 mm in diameter wheel-shaped with a shallow tube; lobes ovate-triangular, light green with dense brown blotches, densely puberulous outside, hairless inside. Outer corona cup-shaped with squarish, 2-toothed lobes overtopping the staminal column; inner lobes linear. The flowers have a foetid smell. Fruits cylindric. See B. richardsii for comparison. Habitat: On sandy soils in Brachystegia woodland. Hyde, M.A., Wursten, B.T., Ballings, P. & Coates Palgrave, M. (2019). 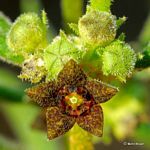 Flora of Zimbabwe: Species information: Brachystelma dinteri.